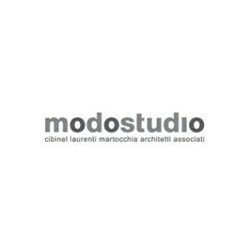 modostudio is a multi-disciplinary practice of architecture, urban planning and industrial design. Profiting from the diversified skills of the founding partners and the continual collaboration with experts from various fields, modostudio combines architectural theory, research, innovation and experimentation with high technical knowledge and professionalism. Established at the end of 2006 by three principal architects, Fabio Cibinel, Roberto Laurenti, and Giorgio Martocchia, after many years of collaborating with internationally acclaimed architects like Massimiliano Fuksas, Piero Sartogo, Erik Van Egeraat and Kas Oosterhuis, modostudio in a short time was awarded and shortlisted in many international architectural competitions. modostudio partners have been teaching architecture at Cornell University, IED - European Institute of Design and at National Istitute of Architecture.